The Garfield Park Conservatory Alliance (GPCA), graciously thanked the CHIditarod Foundation for its support of their efforts to address the need for fresh produce in our local neighborhoods of East and West Garfield Park, which are known food deserts within the City of Chicago. The $2,500 grant awarded to GPCA by the CHIditarod Foundation was instrumental to their two main work objectives: 1) growing and donating produce to immediately address the need for access to healthy foods, and 2) educating, training and supporting local gardeners to grow fresh vegetables to feed their community over the long term. Working in partnership with the Garfield Park Garden Network and the Chicago Community Garden Association, GPCA was able to engage the community in two fundamental ways during the past nine months. 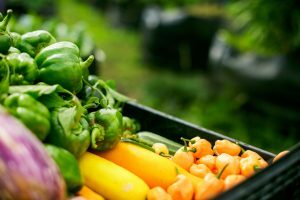 First, they provided educational opportunities so that community gardeners could develop and strengthen their skills for sustainable practices. Second, they provided the material resources needed to ensure community gardeners an optimal start to the 2017 growing season. The Garfield Park Garden Network includes 6-9 operational gardens, which are cared for by 55 community gardeners and an additional 30 youth interns during the summer months. • Through a ‘How to Plan Your Vegetable Garden’ workshop at the Chicago Community Garden Association’s March conference and a second session for Garfield Park Garden Network gardeners, we demonstrated how to successfully plan your garden to 46 gardeners. Plant spacing and soil health were prioritized in these workshops to increase health and production of the plants. • In addition to the workshop, we hosted an important meeting of the Bionutrient Food Association, a group that promotes healthy soil and provides education about the challenges of growing in urban environments specifically. • The Conservatory hosted the Urban Agroecology Class series. 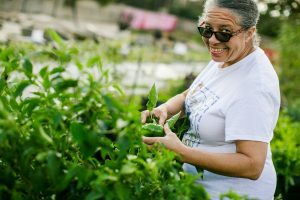 These classes were promoted to the community and attendees were encouraged to share what they’ve learned with their respective gardens and neighbors. • Setting up a volunteer scheduling system for the Fulton Street Greenhouse to maintain seedlings for distribution among Garfield Park Gardens. limiting the wilting of greens, and market signage. • Soil testing and amendments for community gardens (to be purchased in May). This includes straw mulch for garden beds to increase soil health. By providing seedlings and educational training, we hope community gardeners can continue to build on their skills and knowledge and share their expertise with the newer gardeners in the group. Through monthly meetings, GPCA will continue to share ideas and tips with community gardeners, and we hope to schedule a garden tour to show off what is happening in each of these gardens with the broader community. This year, we will focus on involving the community gardeners in seed starting – primarily at the Fulton Street Greenhouse, which has partial heat. We will continue to develop and evaluate the success of this growing operation over the summer so that it can be fully set up for the next growing season.